General Mobile Radio Service (GMRS) is a short-range, two-way, UHF radio service allocated for use by licensed individuals and businesses. Its marketed maximum range can be as far as 25 miles, but its actual range is usually closer to 1-5 miles. 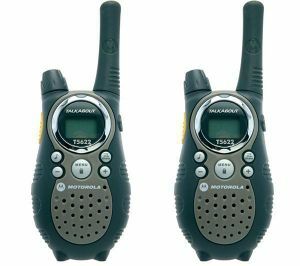 The advantage of GMRS is in its compact, inexpensive radios that are excellent for communicating inside of a small area. GMRS radios operate at .5 watts when FRS mode but may go to 5 watts while in GMRS mode. You must have a license, which is good for 5 years. License fees are adjusted annually and currently are $85. The license holder must be 18 or older (this can enable their immediate family members to operate under their license). No test is required to obtain a license. See the general rules of selecting a radio. In addition if you have a detachable antenna you may want to look at the homebrew antennas section for ideas on how to improve your device. This page was last modified on 1 April 2014, at 17:20.